October 31, 2016 Robert W.
Quick signs can be your when you need them in Las Vegas. There are many reasons for needing quick signs and there are many sign shops in Las Vegas that can help you when you do. Las Vegas is full of sign shops with the latest sign making equipment. Large format printers ( also known as wide format printers) are the sign shops best friend. These large format printers are capable of printing on a variety of substrates in all the colors. These printers can print banners and vinyl signs at over 200 sq. ft. per hour with amazing quality and with ultra bright and ultra vivid colors. The newer printers instead of printing in cmyk, now offer cmyk plus light magenta, light cyan, orange and light black for a wider assortment of colors. These large printers speed the sign making up dramatically and also keep the costs of making a sign very reasonable because of the less manpower involved. Quick signs are also available for people attending conventions at The Mandalay Bay Convention enter, Sands Expo and the Las Vegas Convention Center. People working these conventions often find themselves in need of display graphics at the last moment for many different reasons. The graphics could be damaged, shipped accidently to the wrong location, or simply lost. If this is the case, rest assured that Las Vegas has many sign and print shops willing to help out and make sure the “show goes on “. The hard part of creating or designing the graphic is already done and only the production needs to occur. Quick signs can be had at many of the sign shops in Las Vegas at very reasonable prices. Simply do a internet search for “Quick Signs” and many results will come up leading you to getting your sign done in time. October 30, 2016 Robert W.
Las Vegas overnight sign banner prints are available in Las Vegas at great pricing. There are many instances where signs and banners need to be printed in a hurry for a variety of reasons. Las Vegas is 24 hour town and sign banners can be printed within 24 hours also. In fact, many sign shops in Las Vegas offer same day and/or next day sign printing. Sign making has come a long way in the last few years. With the invention of the wide format printer and the updates to the printer, hi speed banner and sign making is now possible. While it just seems like a few years ago that painters were still painting billboards, large forma printers have made these painters obsolete and can make a large banner faster and cheaper than ever before. These printers can print banner and signs at amazing speeds with incredible clarity of colors. These printing machines can print several hundred feet of banner every hour. Las Vegas overnight banner prints are available through sign shops that have these amazing large format printers. These large format printers come in handy when you have to have a sign or banner made in a hurry. The conventions and trade shows held in Las Vegas require overnight printing because many times display graphics are lost or forgotten back home and they need to be replaced in a hurry. In addition, many companies require up to date display graphics because of changing marketing positions. What might be a good display graphic in the morning, may not be applicable for the afternoon or following day because of changing conditions. 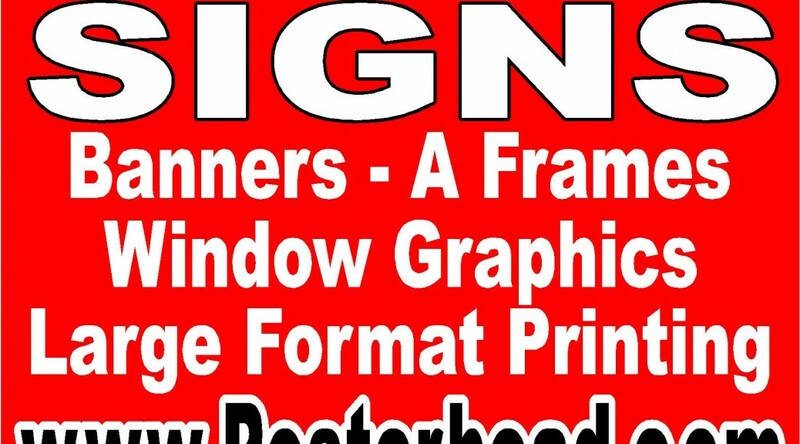 Las Vegas overnight sign banner prints can be found at modern sign or print shops in the Las Vegas Valley. You can find these shops online or through the local yellow pages . October 29, 2016 Robert W.
Banners near me 89119 is a great search term for people at the Las Vegas Mandalay Bay Convention Center. Mandalay Bay has one of the largest convention centers in Las Vegas and in the United States and many companies and individuals come to the convention center and find themselves in need of last minute signs and banners. Las Vegas boasts having more conventions and trade shows than any other place in the world. More trade shows and conventions are held in the City Of Las Vegas than any other place. This is because Las Vegas not only offers ample convention space, it is a very fun place to visit. Its moderate weather allows for most activities to be held outdoors and the 24 hour fun and festivities is just amazing. In addition, Las Vegas has fine dining, entertainment, luxurious hotels and a host of other amenities that no other place in the world offers. Banners near me 89119 can help you get your banner in a hurry. Businesses and people attending the convention at Mandalay Bay often times find themselves in need of banners and signs as a visual reinforcement of the marketing message they are trying to send to their customers. Banners and the popular banner stands are one of the main display graphics that are used at these conventions because of their economic value and the ease in which they can be set up. One person can put up a retractable banner stand or banner in just a few minutes. In fact, when placed next to each other, portable banner stands give off the impression of a media wall ( or one single graphic. Banners near me 89119 give you the opportunity to find sign and banner shops near the 89119 zip code. This allows for convenience in obtaining your banners and signs in a hurry or simply allows you to start price shopping for the best banner and sign prices. 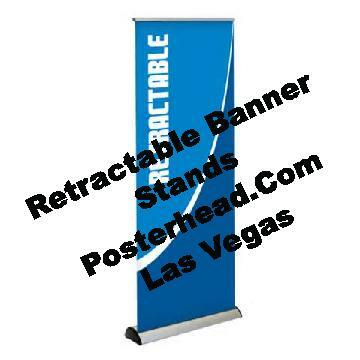 October 28, 2016 Robert W.
Banner stands Las Vegas 89109 are very popular with people displaying at trade show booths. Banner stands Las Vegas 89109 are very compact and take up very little room but are great for displaying your goods and services that you are offering at the trade shows and conventions. These banner stands can be used many times and are easy to travel with. Banner stands Las Vegas 89109 are one of the most, if not the most, simple and popular graphic display at trade shows and conventions. These graphics are easy to travel with and only take a minute or two to set up for display. Take down time is about the same length of time. These banner stands come with a convenient carrying case and airlines accept them for travel without problems. The banner stands are generally are good for banner and the banners cannot be easily swapped out. The x stand banner stands are made for banner swap outs and can be used over and over again. The downside is that the x stand takes up more room to display and sometimes space is a valuable commodity at a trade show booth. October 27, 2016 Robert W.
Custom Las Vegas overnight banner stands are sometimes needed at trade shows and conventions in Las Vegas. In addition, businesses like to use these custom Las Vegas overnight banner stands for business presentations because they are so portable and easy to set up. Conventions and trade shows love these banner stands because they are compact and help graphically display their products and services. Custom Las Vegas overnight banners stands are available same day or next day. These banner stands are easy to make and very affordable. Since Las Vegas has so many trade shows and conventions, they are readily available at most sign shops in the Las Vegas Valley. Las Vegas is the ” Grand Daddy” of all places to jhold a convention or trade show because of all the space available, hotel rooms and 24 hour fun the city has to offer people coming to Las Vegas . They are very popular to make and many sign shops carry a variety of banner stands in stock to accommodate many graphic display needs. One of the most popular sizes, the 33″ x 78″ banner stand, comes with an adjustable pole so that the height of the banner can be adjusted. This model of banner stand ( also known as a retractable banner stand) sells for less than $100. The banner stands also come with a convenient carrying case which makes them easy to travel with. The set up time for banner stands is generally about 2 minutes. Many signs shops offer expedited service to the trade show attendees because they realize that graphics are such an integral part of the convention industry. Several sign shops offer same day graphics or overnight graphics so that they can be ready the next day. Many times they offer these banner stands and other graphics at no additional charge ( depending on work load). October 26, 2016 Robert W.
Banner Signs near Mandalay Bay 89118 are available for trade shows and conventions held at the Mandalay Bay Convention Center. Banners and signs are a integral part of a trade show and convention because they are a visible representation of what you are trying to sell. There are many types of banners and signs that are used at these shows. Retractable banner stands are very popular at conventions and trade shows. These retractable banner stands come in a compact carrying case, but pull up to make a very effective visual display. One of the most common sizes of retractable banner stands is the 33″ x 78″ stand that sells for under $100. It is very popular because you can adjust the vertical height of the banner with its adjustable pole. These retractable banners can be used over and over again at the various trade shows and conventions. Banner signs near Mandalay Bay 89118 also include vinyl banners. These vinyl custom banners are used in the booths of the trade shows to help the sales person give a visual graphic to reinforce what they are trying to sell. These vinyl banners are cheap and very cost effective and average about $2.00 a square foot. This price includes hemming the perimeter of the banner for strength and then strategically placing grommets on the banner so that it can be hung very easily. Foam core board signs are also very popular at conventions. These signs are made with a vinyl application to a 3/16 foam core board ( and then laminated on top for a professional appearance) and cost about $4.00 a square foot. 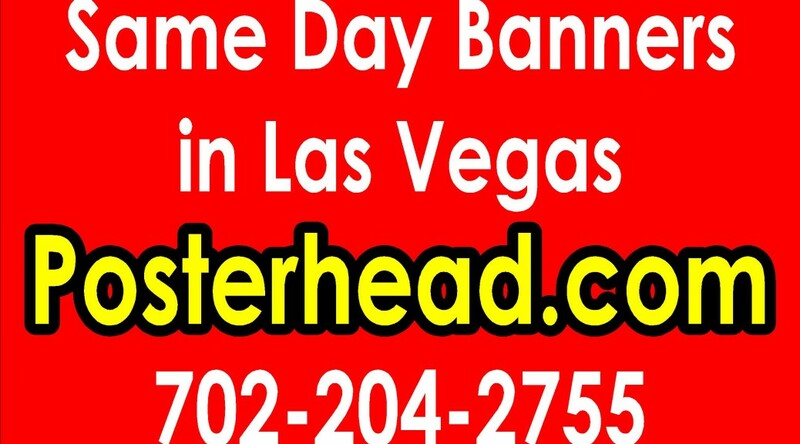 Banner signs near Mandalay Bay can be had at local sign and print shops in the Las Vegas valley. Simply do a online internet search for ” Signs Near Mandalay Bay” and many sign shops will turn up in the search results that want to help you. October 25, 2016 Robert W.
Large format printing 24 hour Las Vegas allows for you to get your large format printing done in a hurry. More often than not, people displaying at a trade show or convention will find themselves in need of last minute graphics. This could be because of marketing strategy changes or simply because display graphics were lost or damaged. Large format printing 24 hour Las Vegas is available at select sign facilities in Las Vegas. Simply do a online Google search with the term, 24 hour sign printing or same day signs in Las Vegas to find a sign or print shop that can assist you with your rush order prints. October 24, 2016 Robert W.
Signs near me Las Vegas 89119 allow for people at the Mandalay Bay Convention Center locate a sign shop close to their location. Many times exhibitors attending the shows at Mandalay Bay Convention Center find themselves in need of banners and signs in a hurry. If this is the case, Google or searching online for ” Signs Near Me Las Vegas 89119″ will bring results of close by sign and banner shops that can assist you with your graphic needs. In addition, there are various smaller venues that host conventions and trade shows at their casinos and hotels. Every casino like Circus Circus Casino, Flamingo, Caesar’s Palace, etc. have convention space available. It seems that everybody wants to come to Las Vegas to have their conventions because of all the fun and reasonable prices that Las Vegas has. After all, how many cities have 24 hour entertainment, fine dining, luxurious accommodations, gambling and all around fun that Las Vegas has. Because of this, Las Vegas has many sign and banner shops that can assist in making banners and signs very quickly and at very reasonable prices. The competition at sign shops promotes a healthy price competitiveness. In fact, many people attending the trade shows and conventions prefer to have their graphics made in Las Vegas rather than bring the graphics along with them since many times the graphics get lost/damaged while being transported. Signs near me Las Vegas 89119 can help you find banners and signs near the Mandalay Bay Convention Center at very reasonable prices to help you make your trade show a positive experience. October 23, 2016 Robert W.
Banners near me 89109 allow for people seeking banners and signs to find sign businesses close to the Las Vegas zip code 89109. The zip code 89109 is basically the zip code for the Las Vegas strip. This area has the Las Vegas Convention Center ( LVCC) , Sands Exposition Center and a couple of other convention center locations. Many people who attend these conventions and trade shows need banners and signs for their display booths and need to find a reliable sign facility close to their location. Las Vegas is the choice of professionals to host their conventions and trade shows. More trade shows and conventions are held in Las Vegas than any other place in the United States. Las Vegas offers so much more than convention space, they offer an atmosphere of hospitality and fun like no other place in the United States. There are top restaurants, entertainment, gambling, and a 24 hour carnival atmosphere that allows people to have fun while there here. In addition, the weather allows for 24 hour outdoor activities. Consequently, more people come to Las Vegas for their business trade shows than any other place. Banners near me 89109 allows for people to locate banner and sign shops close to where they are. This is important because many times people attending trade shows require last minute banners and sign because theirs were lost or damaged and need replacement. Las Vega has many sign and banner shops that can make banners very quickly ( often the same day) at very reasonable prices. These banners sell for about $2.00 a square foot and are full color ( meaning you can have as many colors on the banner as you want). Simply Google or search online with the term, ” banners near me” and a host of results will come back allowing you to choose the right banner and sign shop near you. October 22, 2016 Robert W.
Signs near me Las Vegas is an internet tool used to find a sign company close to you when you need one. One simply uses their cell phone or computer and Google’s “Signs near me ” and the search results will list the sign shops near the person searching. Signs near me Las Vegas is great when you are visiting Las Vegas for a convention or trade show and you need signs and do not know where to go. So often at the trade shows, graphics are lost or damaged and need to be replaced in a hurry. By searching ” Signs near me Las Vegas” on your cellular telephone, it will guide you to a local Las Vegas sign shop that can assist you in getting your graphics replaced. Whether you need a vinyl banner, banner stands, vinyl prints, posters or other type of graphics, you will be able to find a sign shop that can assist you. The Las Vegas sign shops have state of the art sign making equipment to get your signs replaced with quality graphics at very competitive rates. Many people attending the trade shows and conventions prefer to have their display graphics made in Las Vegas because of the competitive pricing and the hassle from traveling with the graphics and the possibility of the graphics being damaged or lost while being transported to Las Vegas. Many of the sign shops in Las Vegas offer graphics rather quickly and many offer same day graphics. Las Vegas is the number one destination for conventions and trade shows and consequently has many sign shops that cater to the people attending the trade shows. Signs near me Las Vegas is not limited to people visiting Las Vegas, but also includes local businesses and promoters who need to find a sign shop.